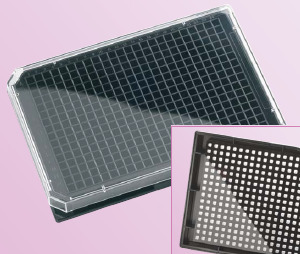 Porvair Sciences range of solid bottom 96- well assay plates is specifically designed for absorbance, fluorescence, luminescence and scintillation applications. The 384-well format, with its higher density of wells, allows more work to be carried out in a standard sized plate, aiding higher throughput. Well volume is 120?l per well. All of these plates are manufactured from high quality polystyrene. Porvair Sciences clear bottom 96-well Krystal plates are optimised for fluorescence and luminescence. Proprietry ultra-sonic welding is used to assemble the clear bases to the solid top plate in our clean room. The unique Krystal 2000 plate range from Porvair Sciences has been optimised for luminescence and fluorescence assays. Manufactured for whole-plate CCD imaging and laser detection applications, Krystal glass bottom plates consist of a polystyrene upper part and a clear borosilicate glass sheet fixed to the base with a proprietary adhesive. Recently, scientists have begun using assay chemistries which require excitation or detection wavelengths in the far UV region, below 350nm.